The Volunteer crew of the Lytham St Annes RNLI Inshore Lifeboat Sally responded to a request to launch from Holyhead Coastguard at 6.46 pm ton Wednesday 4th May when four girls were seen on the river bank near the 8 mile perch with the Spring tide starting to flood rapidly into the channel, cutting them off. The ILB was taken to the launch site at Seafield Road (Church Scar) with three crew members and set off upriver to the girls. 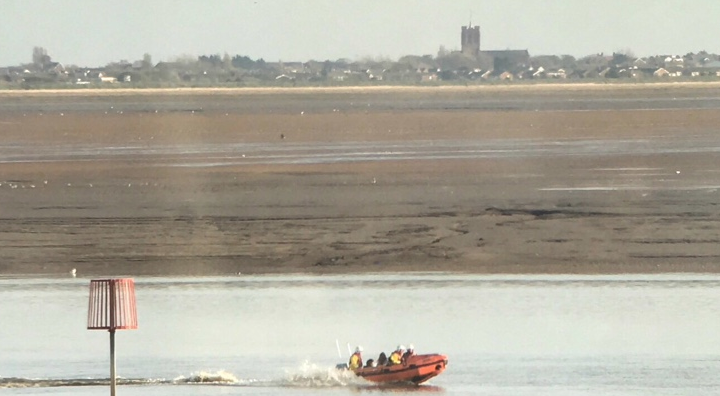 The teenagers very sensibly did not attempt to cross the rapidly filling channel to get back to the Lytham side as that could have put them into great danger. The inshore lifeboat took the girls off the bank and brought them back to land them at Seafield Road. They were then passed into the care of the Lytham Coastguard mobile unit who drove them up the beach to the Promenade.